SoundRoots World Music & Global Culture: Monday's mp3: Attack of the Txalapartari! Monday's mp3: Attack of the Txalapartari! 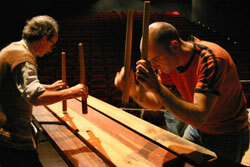 The players, called TXALAPARTARIAK, use short wooden sticks about 10 inches long and an inch and a half in diameter to hit the boards following a set of rules for rhythm. Each txalapartari has his or her own space of time that can't be invaded by the other txalapartari. This space of time can become longer or shorter during a session of playing and this respect for the other player's space is what keeps the rhythm from breaking down. And now you know about as much as do I about the music of Basque group Ugarte Anaiak. Except that I've heard it, and the amazingly intricate rhythms bring to mind African drum polyrhythms, or Indonesian gamelan, or Stomp at a construction site. End even with a limited melodic pallette of three or four tones, the music is, well, music -- not just percussion. This album begins with two purely txalaparta tracks, then other instruments (accordion, synthesizer, percussion) are layered in. Like Indian tabla, however, the txalaparta maintain a melody of their own even as they provide percussion for the larger group. For those who think they've heard it all, this little-known music will be a fascinating discovery.